The relationships between entrepreneurs and venture capitalists vs. authors and publishers are more similar than you might think. Book publishers launch more new products each year than any other industry on the planet and the number is growing. As an industry, we introduced over three million unique products to the marketplace in 2010 and each one of those books started in the same place: with no awareness, no audience, and no sales. Entrepreneurs and their startups face the same problems. The question I have been pondering over the last several months is what publishing might learn from the world of startups. The first question we have to answer is whether the comparison is justified. In the world of startups, entrepreneurs are looking to venture capitalists for funds to build and scale an idea; it is much the same as the relationship authors have to publishers. Venture capitalists bring the money, the connections, and a point of view about what is going to be successful. Entrepreneurs bring the idea, they bring the hard work, and they bring the customers. When we take these qualities to the publishing industry, the parallels between venture capitalists and publishers hold up well. The comparison of authors to entrepreneurs is also strong, though writers must appreciate their role in engaging readers to buy books. “I can’t get your mom to buy your book,” my publisher explained when I signed the contract for my first book. Founders don’t expect their funding sources to deliver paying customers, authors shouldn’t expect that of their publishers either. In publishing, we say a book needs to find its audience and, often, that audience is different from the one envisioned by both the author and the publisher. This would not surprise anyone who works in startups. If you listen to leading thinkers in the area of startups, people like Steven Blank and Eric Ries, you will consistently hear the same thing: the purpose of every startup is to search for a business model — searching for customers, searching for price points, searching for distribution channels. Steve Blank says, “A business plan never survives first contact with a customer.” This is a sentiment any book publicist can relate to, especially when their plans crash into journalists and producers who may have different ideas about a book, author or topic. Success in startups comes from minimizing the distance between customer and company and shortening the time between idea and product. In book publishing, we seem to maximize and lengthen the gaps, straining our ability to connect actions with results and, more importantly, removing the opportunity to learn. Instead, an editor’s intuition serves as proxy for an audience’s actual felt need. The books acquired into the twenty-four month production cycle require a timeless quality, a quality that reduces risk but forces the need to manufacture urgency when the moment of publication comes. The unfortunate aspects of book publishing are easy to overlook and some might even be inclined to declare them qualities that support the industry’s strengths. I think that would be a mistake. Entrepreneurs believe they are always adjusting their startups to move closer to a maxima, a business model high point that can support their fledgeling enterprise. Writing book proposals involves this sort of knob turning, but then we stop. We take on risk, large amounts of risk, as we create in stealth mode outside of the purview of the customers who would most benefit from our work. I have been working on a project that calls into question some of these assumptions about how books are created. In July, O’Reilly digitally published the first two chapters of Every Book Is a Startup as what the startup community calls “a minimum viable product” or MVP. The goal was to test the waters with a small but substantial piece of material and see if a need existed around this idea. At the end of the MVP, I invited readers to visit a separate website to gather feedback and interact with each other around the ideas in the e-book. Comments from readers helped shape the direction for the next release of project coming in October. When Every Book Is a Startup is finished early next year, the finalized book will be made available both in both paper form and digital form. We are also experimenting with dynamic pricing. The two chapter edition is currently priced at $4.99. As we add more content the price will go up, but independent of the purchase price, and each buyer gets all of future updates for free. We are encouraging customers to buy early and engage in the creation of the book. There are plenty of examples of others who have tied customer need to book creation. Pragmatic Programmers has a Beta Books program that lets users buy books in their unfinished form and encourages early readers to submit errors they find. Logos Software lets customers pre-order books in a futures market and, when enough orders exist, the project goes into production. There are many things we can learn from the world of startups, but they all funnel back to this insight: deliberate learning of what our customers want connects directly to the success of our startup. 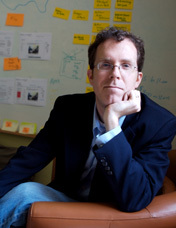 Todd Sattersten is the founder of BizBookLab, a company that specializes in business books and the business of books. 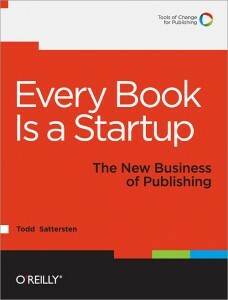 He is the author of Every Book Is a Startup: The New Business of Publishing (O’Reilly, 2011), and will appearing at Tools of Change Frankfurt on Tuesday October 11th at 12 p.m.
SURVEY: What New Publishing Business Model Excites You the Most?